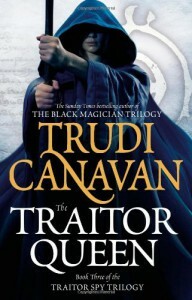 I wanted to really like this book, and this sequel trilogy to the Magician's Guild trilogy by Canavan, but I just couldn't. I mean, yes, it was interesting and all but it just couldn't live up to the first trilogy and looking at some of the other reviews for this book it seems like an opinion shared by many fans. Warning, there may well be spoilers ahead, but some of this is stuff mentioned or referred to in previous books in this trilogy. Firstly, the plot. It continues that set up in the first two books in the trilogy, with Sonea and Regin heading to Sachaka to meet with the Traitors, whilst Lorkin and Dannyl try to stop the Sachakan King from reading Lorkin's mind now that he's returned to Arvice from the Traitor's home. Meanwhile, Lilia deals with being a black magician and trying to capture the rogue Skellin. The plot just moves at a really slow pace, and whilst it is nice to see some character development in these chapters, I do feel a lot of it in the first half could have been condensed. Then in the second half of the book the majority of the action takes place really quickly and it kinda feels a bit rushed. Also, there were some parts of the story that I just really didn't care about. Plus, I did kind of like Lilia and Anyi, and I guess it was important and nice to see how things have changed and are different for the next generation. But the whole Skellin plot seemed really irrelevant in the end. I thought it might somehow tie back in to what was happening in Sachaka but it didn't and it was just there really to give Lilia and the magician's in Kyralia something to do. Also, it ended really quickly and was rather an anti-climax apart from, you know, the face Cery died. Heart = broken. But I did kinda see it coming . I felt like I was supposed to like Lorkin as a main character, but I just didn't. He was rather boring and flat. And I also felt like I was supposed to like the Traitors and want to root for them, but I didn't either. I mean, I liked that they wanted to abolish slavery and stuff, but other than that they just seemed ruthless and arrogant and no better than the Ashaki they were trying to overthrow really. I wanted to see more of Sonea being a badass like she was in the first trilogy, but she wasn't. I kind of understood why, since she's spent the last 20 years feeling like an outcast and stuff and missing Akkarin, but I wanted to see her regain her former life and courage and she didn't. She didn't really do anything in the end... and don't even get me started on the whole ReginxSonea thing - it was just stupid. Canavan obviously just wanted to give Sonea a new love interest but didn't want to or couldn't spend time developing a whole new character for her . What did interest me though was Canavan's hint in the epilogue of another nation in this world that is starting to develop new technologies such as a "ballshooter" which sounds remarkably like a gun to me, and made me think that the minefire mentioned earlier in the book could be gun powder which hadn't occurred to me at the time. This sounds like an interesting idea and I hope it's an avenue that Canavan explores further in another book(s). It would be interesting to see how the magician's dealt with such a technological revolution.